I was there the night that Garmin Forerunner 305 passed away. It was such an ordinary Sunday evening: we’d gone for a bike ride, and I was just getting ready to program Monday’s workout into 305. Suddenly, his screen went blank, and he became entirely unresponsive. Oh, I tried to save him. I plugged him into the wall. I plugged him into the computer. I tried soft resets and hard resets, according to the owner’s manual, time and time again. I cried. I begged. But still no response. The next morning, I called the Garmin support center, and though they too tried valiantly to save him, it soon became clear that 305 was gone. We had a good almost-five years together, 305. I remember the day I got you. It was a few days after Christmas. Jordan and I had gone to his parents’ first, and we had just arrived at my parents’ house. I told my dad that I had received some gift cards for Christmas, and that I wanted to spend them on “this really cool watch. It tracks your pace, distance, calories, heart rate — everything!” Of course, I was talking about you. As soon as my mom walked into the room, Dad insisted that we open gifts immediately. And that’s when I met you, elegantly wrapped in glittery paper and ribbon. From that moment on, we were inseparable. You were there with me through training for my first marathon, and you helped to pace me through the race. You’ve been through bitter cold and sweltering hot runs, from the Olympic peninsula to a Mexican beach to Boston. You were there for me through good runs and bad, shouting at me to speed up or slow down as needed. I will miss you, 305. (Not my picture. He died without being immortalized in photo). But even in death, 305 is still giving. As we speak, he is in transit to Garmin headquarters in Kansas, where he will be refurbished. By donating his body this way, 305 provided me with a $70 credit toward his replacement, Garmin Forerunner 210, who should be arriving by the end of the week. Garmin Forerunner 305 was dearly beloved and will be dearly missed. Farewell, old friend. I’m so sad. : ( sniffle sniffle sniffle You told us when we gave it to you it was the best gift you’d gotten that year. sniffle sniffle sniffle. I’m going to miss him too! Waaa! (Imagine me using my teacher voice, look and finger) If you EVER say that you are a bad blogger again, I am going to punch you in the throat . No, I am going to round house kick you in the throat. No, in all seriousness, you are an amazing writer and I can’t wait to read more! I wonder if this new Cassie Tracker will be more in sync with my Sarah Tracker? I never said I was a bad writer, just a bad blogger because I never take pictures. I’ve been using the mapmyrun app the last couple of days, and it’s showing my usual routes as longer than my watch did…so I’m not sure who’s right. I love your clever posts! Sorry to hear about your watch, but at least you get a fancy new one. It’s good to know that Garmin will give credit for broken watch bodies. Oh dear, I’m very sorry to hear of your loss. 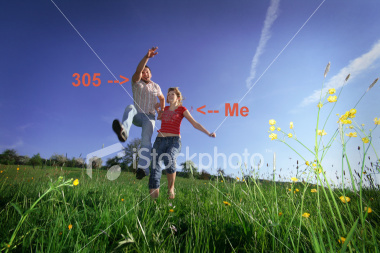 😦 I love the photo of you and 305 frolicking in the field. You’ll make some great new memories with 210 though, I just know it! It’s hard to lose a trusty and faithful friend, but think of the good life you gave him! Good luck with 210! Rip 305 😦 I hope the 210 helps ease your pain. Glad to hear another one is coming!!!!! My Garmin died in the move. Somehow his screen cracked :(. LOVE that you can send it in for a $70 credit. I’m going to call then and try that. Thanks for the tip and so sorry for your loss! They gave me the option of buying a refurbished one for $70 or getting the credit. I figured the refurbished one wouldn’t last long, so I just upgraded. Hopefully they’ll give you the same deal! Be warned, though…I was on hold for at least 20 minutes, so make sure you’ve got time when you call. so sad!! I thought mine almost died yesterday (it got stripes all over the screen), but plugging it in seemed to clear up the problem. Whew! Hope you love the 210! I just got the 610 and am enjoying it so far. I love the smaller faces. The small size is definitely exciting. I thought about getting one of the higher models like the 410 or 610, but I really don’t need the multisport. I hope I like this one! Oh my gosh I die! I hope the newer model helps ease the sting of loosing you’re first Garmin love.